Coming up in the ninth inning of this 1991 contest, Victor Cancel's Peoria Chiefs were down by one and needed a rally. Cancel tried to spark one, working a walk - and it worked. Cancel came around to score, and the Chiefs scored again, taking a walk-off win, according to The Wisconsin State Journal. For Cancel, he was able to work that walk in his fourth professional season. It was also one of his last. He didn't come back for a fifth season. 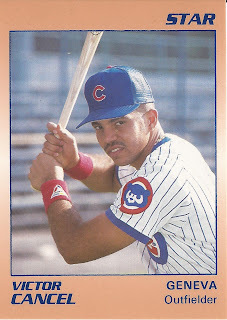 Cancel's career began in 1987, signed by the Cubs as an undrafted free agent out of his native Puerto Rico. He is also known by his middle name, Danny Cancel. He got into his first games in 1988, with rookie Wytheville, just three games in all. He went 2 for 6. Coming back for 1989, Cancel returned to Wytheville, this time getting into 52 games. He hit .291, with eight home runs and 22 stolen bases. For 1990, Cancel moved to single-A Peoria and short-season Geneva. Between them, he hit .243, with no home runs and 17 stolen bases. He hit .286 at Geneva, but just .164 at Peoria. He returned to Peoria for 1991, getting into 105 games there on the year. But he hit just .219, striking out 92 times to 37 walks. It was his final year as a pro.